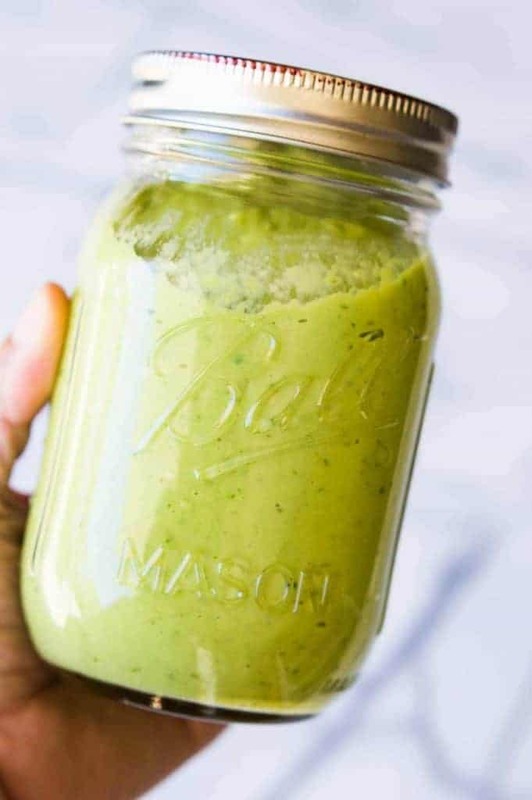 This creamy avocado salsa only takes 5 minutes to make!! 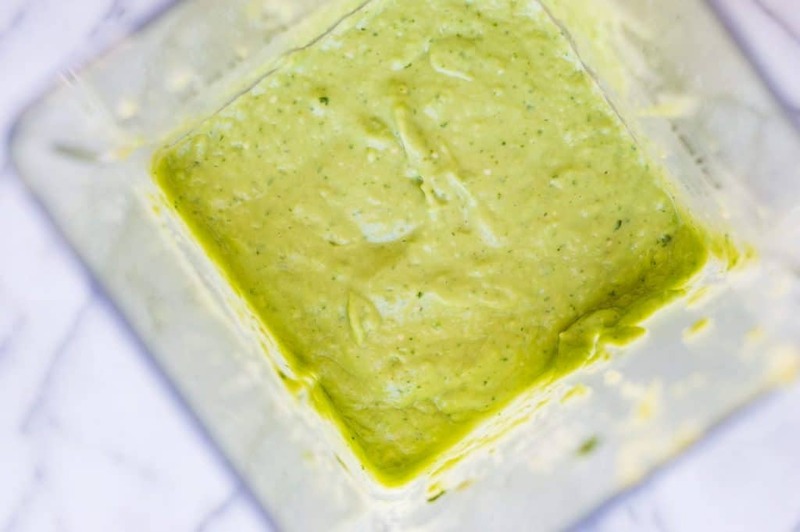 The perfect green sauce for tacos, nachos, burritos, salads, or just for dipping chips into! 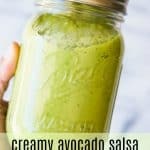 Creamy Avocado Salsa. Or maybe I should call this sauce. A green sauce. Or avocado sauce? I’m not sure what exactly to call it. But whatever you want to call it, just know that it is pure magic. 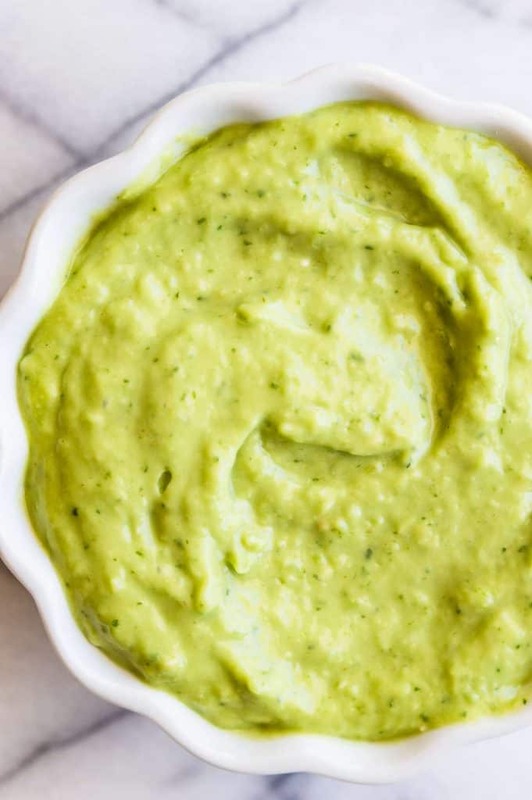 This is the perfect creamy green sauce to drizzle on tacos, nachos, burritos, quesadillas, anything you want. It’s also an amazing salad dressing. 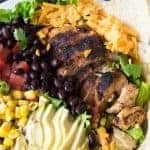 If you’re like me you may feel conflicted about salad dressing on a taco salad. Well..here is the solution to that dilemma! Plus, to my children’s dismay and my amazement, it’s wonderful smothered all over zoodles (spiralized zucchini) So many uses. So much amazing flavor. Best part? It can be made in about 5 minutes. What is in Avocado Salsa? There’s tomatillos. Which if you haven’t used them before, they look like green tomatoes, but they’re covered in a husk, kind of a leafy covering. Usually I find them in the produce section next to the jalapeños and other peppers. They have a tart taste to them. And they are what salsa verde is usually made out of. The tomatillos are what is going to make this salsa more or less runny. If you’re feeling like it’s kind of thick we can add another tomatillo. You can also add a little water about 1/4 to 1/2 a cup of water to thin it out. Why is this so thick? Because we’re adding an avocado to it. Yum! Avocados make this salsa super creamy. Which is why it’s perfect for drizzling. The other star attractions are cilantro, of course. Jalapeño. Which gives just a tiny amount of heat. Feel free to leave some of the membranes in if you’re wanting a little heat. Lime juice. Then a little cumin for flavor. I add cumin to pretty much everything. Onion, garlic and salt. The usual suspects for most salsas. 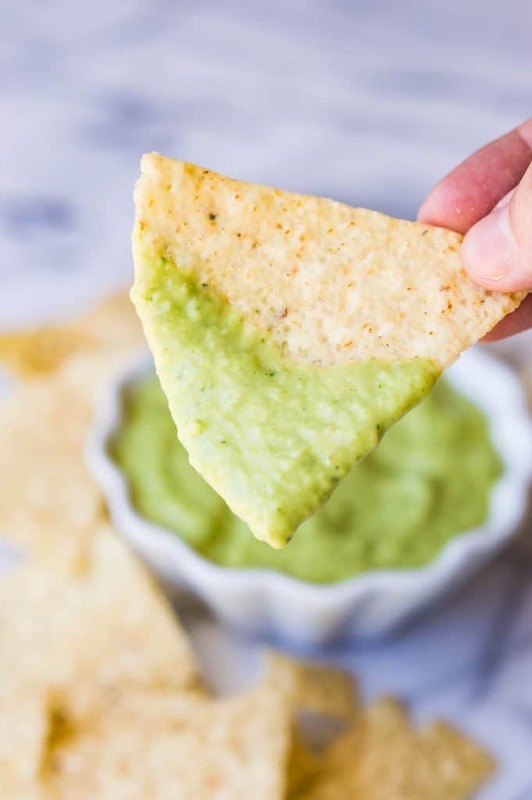 This creamy avocado salsa is perfect for dipping chips into. And trust me you will be amazed at how many things this green sauce is really good with! WANT TO TRY THIS AVOCADO SALSA? 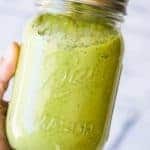 Add all the ingredients to a blender or food processor (affiliate link). Blend until completely combined, will be a creamy smooth texture. 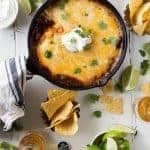 Drizzle over tacos, nachos, burritos, or just use it for dipping! If salsa is too thick pour in about 1/4-1/2 cup of water to thin it out. OK I am definitely trying this! Love the color and everything avocado! This looks amazing! How long will it keep in the fridge? Great recipe. I’ll try it for sure. One simple question. Is there any way to make this salsa to make it last on the fridge at least for 2 or 3 days? Is there any trick to do that? Thanks so much! The salsa will last for about that long. With the other ingredients, the avocado will still be good 🙂 I usually am able to keep mine 2-3 days before we use it all up. Looks great, but isn’t that just…guacomole? This is called salsa de agucate. Always a delicious salsa to go on some delicious tacos. It keeps about 4 to 5 days. Love this salsa de agucate. Always a delicious salsa to go on some delicious tacos I have yet to try this on a salad. It keeps about 4 to 5 days. Wish there was a way to jar this so it can keep much longer, any ideas? Just made this for the first time. Simply delicious. Was concerned that the uncooked tomatillos would be hard to work with but came out perfect. This salsa was perfect with fish tacos! The perfect balance of zippy, creamy, and fresh. Just made it. It is incredible! I was surprised he avacado was able to carry through as well as it did. I am in love with this and don’t think it will last through the afternoon in the house. how do you prepare cilantro to use it? Do you pick off leaves mostly and chop them up? Or do you use a fair amount of stem (easier and quicker, since we eliminate much of the picking)? Hi Sue! Typically I just toss in the leaves and a bit of stem. I don’t pick the leaves off. I cut off the stems before the leaves begin, but use the rest. Hope that helps! 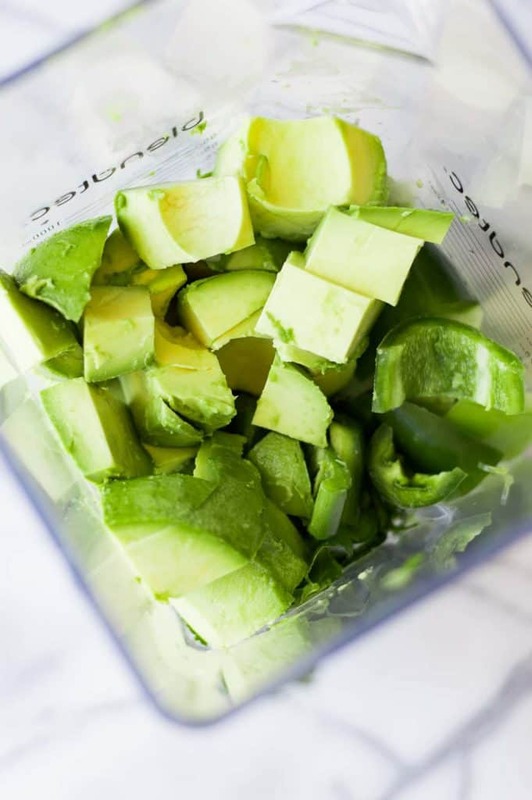 Leave the avocado pits in and it will stay fresher a bit longer…. This is delicious, Can it be canned or would the heat of trying to can it destroy it?? Hi Kymbra! So glad you like the salsa! I don’t know if it is able to be canned, I haven’t tried it. I love this! So simple but so good! That was really, really good! Definitely going to make that again! 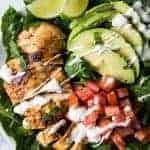 It made the perfect dressing for the chili lime chicken salad – proving that things that taste fantastic don’t always have to be bad for me. Thank you for sharing this. Question: I’ve been given a boat load of Avocado’s and I want to make your Avocado Salsa recipe which sounds delicious. 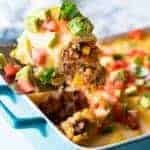 My dilemma is I have to many Avocado’s not to spoil by making one batch at a time, so I want to know if this salsa recipe can be frozen? Yes! It can be frozen. I don’t recommend canning it with the avocados. But freezing works. i just want to know what the shelf life is of the sauce? This will last in the fridge for about 5 days. It doesn’t brown. Just give it a shake in a jar or a stir when you go to use it. Have you tried grilling or cooking the tomatillos before using in recipe? Not in this particular recipe I haven’t. When I make salsa verde I always cook the tomatillos though. 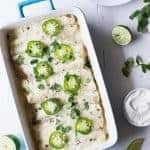 You can definitely grill them up before adding to this recipe and I’m sure it would taste amazing! All I taste is a tomato taste.was looking for a more Avacado or guacamole salsa taste.any suggestions ? All you tasted was the tomatillos? 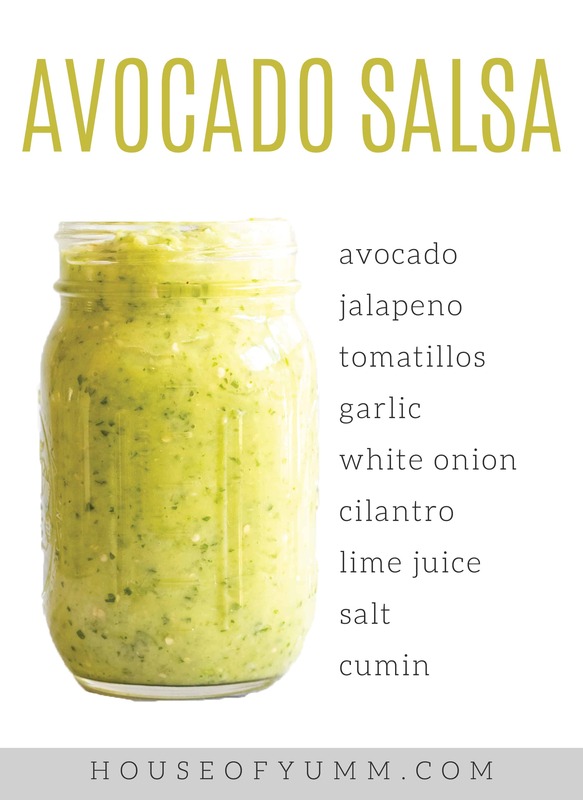 You can add more avocado, just keep in mind that makes the salsa very thick. Do you have a problem with keeping the salsa that beautiful green color? Does it turn brown after a day or so? It doesn’t! I have kept this salsa in my fridge for several days and it doesn’t turn brown. The additions of the other ingredients must prevent that.